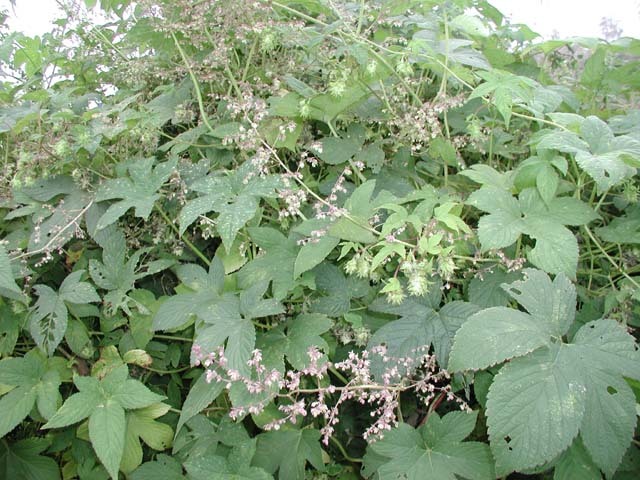 Humulus japonicus.Early Detection & Distribution Mapping Service.edd.mapps.org (Accessed 6/2015). Humulus japonicus is an annual vine; stem green, stout, very rough. Leaves opposite, palmately 5-9 lobed, upper blades 3-5 lobed, hairy, very rough, rather irritating, petiole longer than blade, major veins palmate, secondary veins pinnate, superficially like a vine of Cucurbitaceae but opposite and with more lobes. Flowers greenish, inconspicuous, dioecious (sexes on different plants), female flowers in short spikes above leaf-like bracts, flower bracts less than 1 cm, spiny-hairy, no petals, ovary enclosed in entire, papery calyx. Fruit dry, small, one-seeded (achene), surrounded by persistent calyx; blooming and fruiting July-Oct.
Habitat: Edges, roadsides, moist part shade. 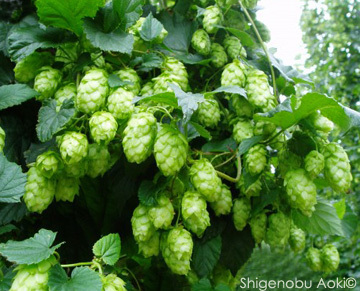 Humulus japonicus.female flowers.© Shigenobu Aoki.nature.jardin.free.fr (Accessed 6/2015). Notes: Very aggressive and fast growing. Sometimes introduced with root balls of nursery plants (personal observation). Host to larvae of the question mark butterfly, Polygonia interrogationis (Nymphalidae), (Tallamy 2003; Pyle 1981).